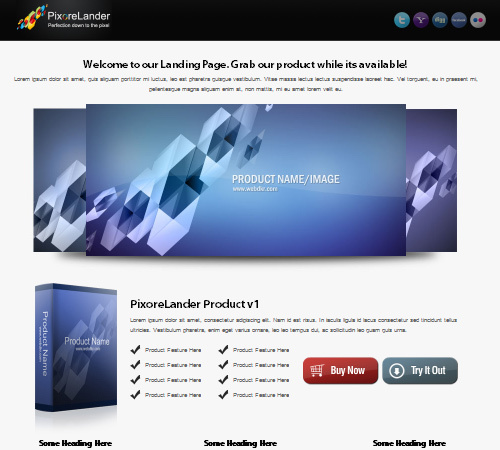 Previously, we have posted a collection of appealing landing page templates that you may purchase in selling your products. In today’s post, a set of promising and delightful templates is given with a more elegant and professional-look that will surely make your products more appealing. Aside from this, the features have extended into a more significant variety that will help the users get the service that they want. Come and check out this 40 New Collection of Professional Landing Page Templates and help keep your advertisements on top! 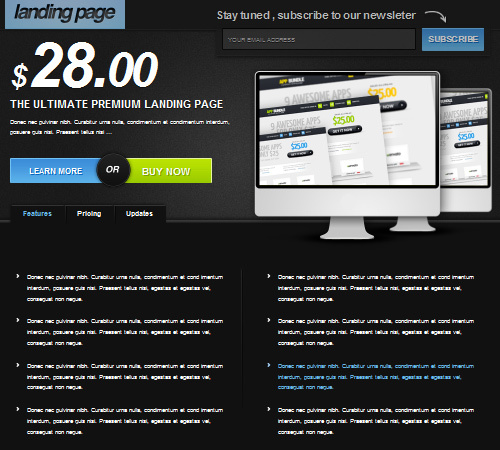 Each landing page’s features are once again given to give you a brief overview of what the templates can offer. 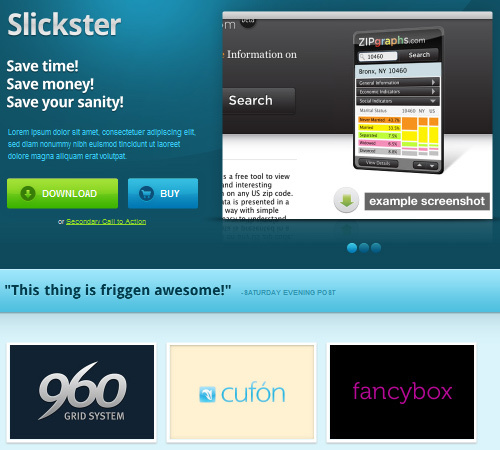 So what are you waiting for, get those mouse clicking and start browsing! 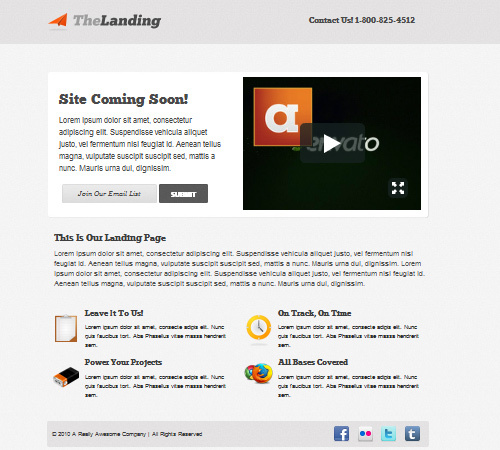 • 3 HTML layout: Contact Form, Nivo Slider, Vimeo. • JQUERY Nice Exposè Effect. 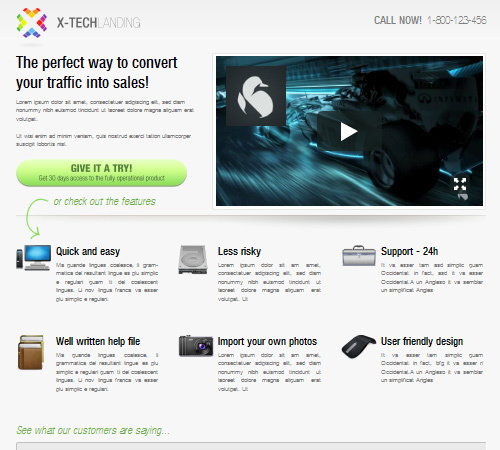 • Ajax PHP working contact form. • W3C Valid HTML Code. • XHTML 1 .0 Strict Doctype. 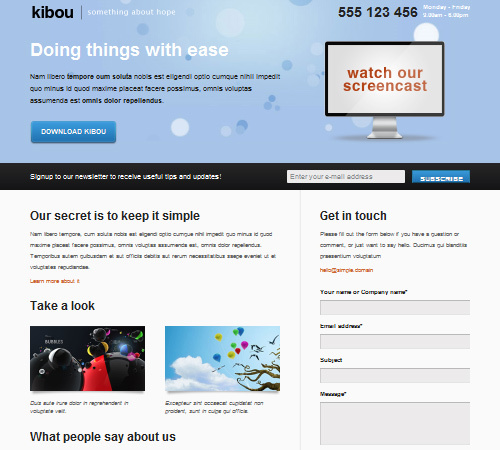 • Page Template With Video Embedding Support. • 960.gs PSD Design and Markup. 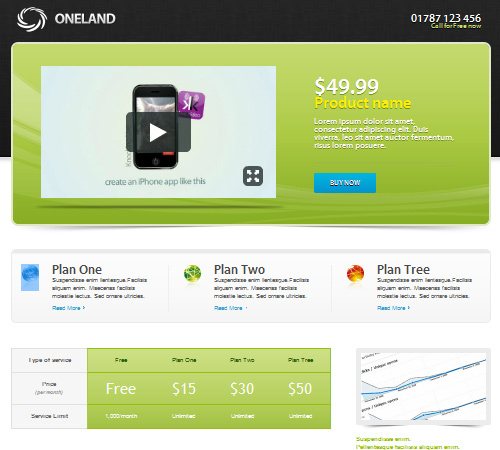 • Custom tabbed featured area, with video support . 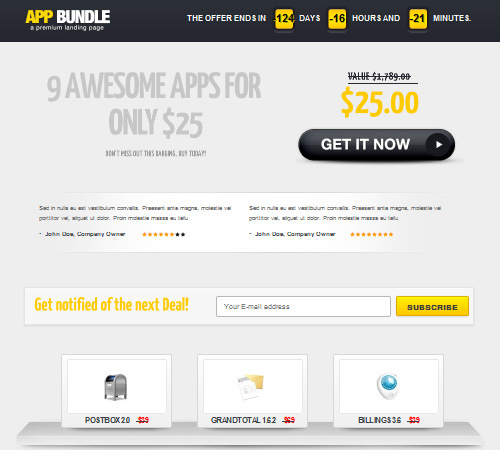 • 8 PSD files included, included individual psd for color options. • Testimonials Column (it’s there but it’s out of the way!). • Fancybox integration in gallery and for Features & Benefits images. 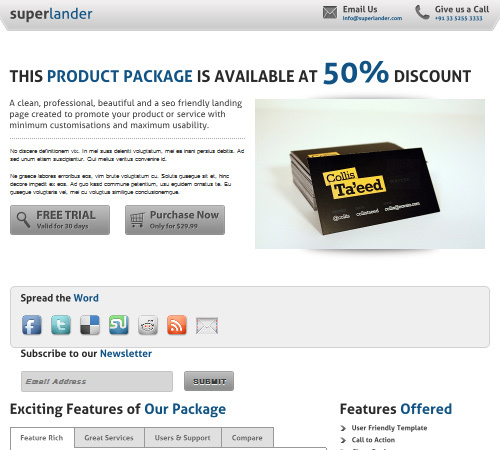 • Optional Subscribe Field and button. 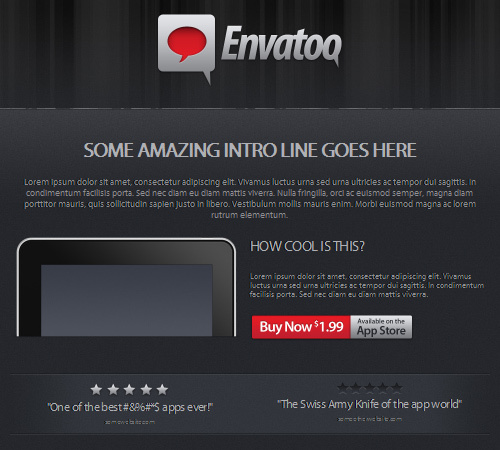 • Two PSD files included. 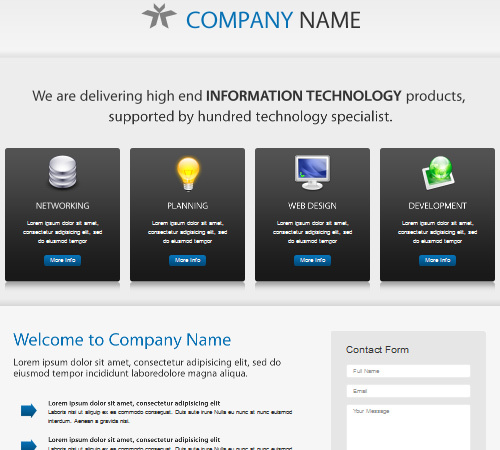 • PHP version included with working contact form. • Working php contact page with Jquery Validation Form. 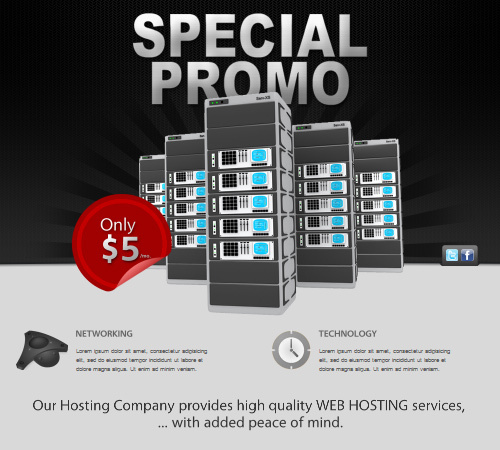 • professional design with a strong business feel. • 5 different skins: red, green, orange, blue and bluegray. 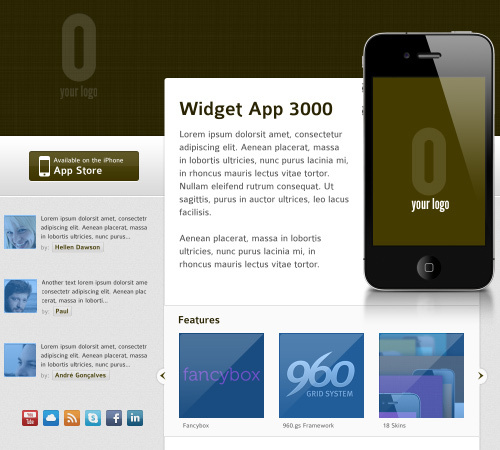 • 2 layouts: with static image and video embed. 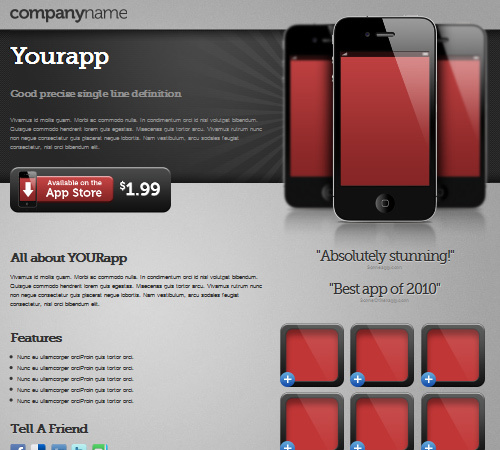 • jQuery lightbox with custom skin. 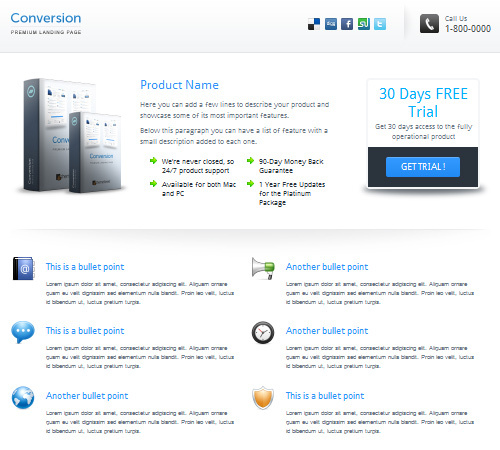 • Usage: Ecommerce – Portfolio – Business. 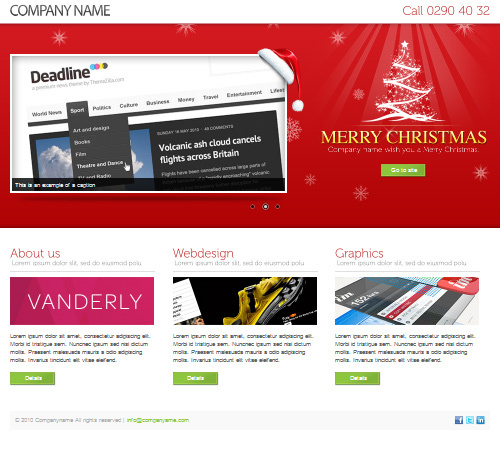 • 5 Themes / HTML Landing Page: with or without Christmas Graphics. • 2 HTML Templates – images Slider & Static Content (to add your vimeo, youtube or any other custom flash players or any custom content). 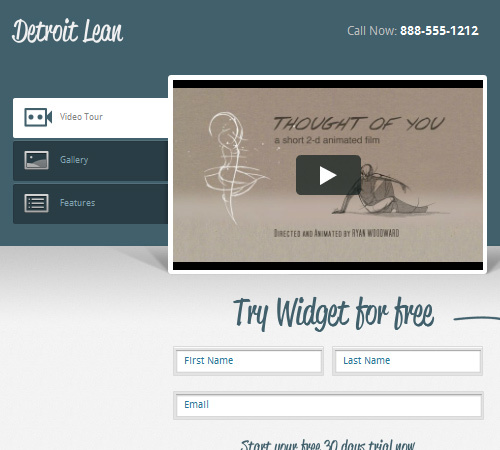 • jQuery Effects: Autofilling form field, Lightbox with fancybox . 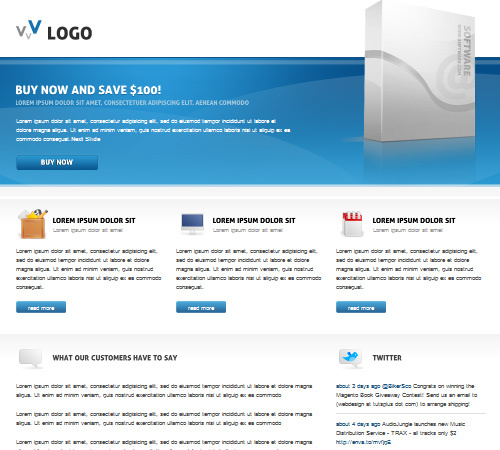 • Layered PSD is included for easy modification. • jQuery for fading effects etc. • Valid CSS and HTML . • Compatible Browsers: Chrome 4, Chrome 5, FireFox 2, FireFox 3, Firefox 3.5, Firefox 3.6, IE6, IE7, IE8, Opera, Safari 4, Safari 5. 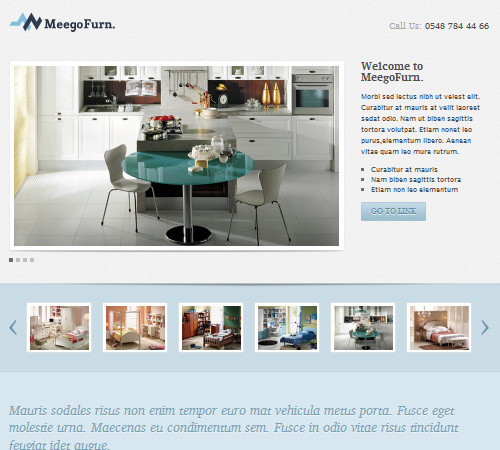 • ThemeForest Files: CSS Files, HTML Files, JPG Image, Layered PSD. • With half or full header video options. • Social Icon Links in the footer. • 54 Button Options (3 sizes x 18 colors). • Compatible Browsers: IE7, IE8, FireFox 2, FireFox 3, Firefox 3.5, Firefox 3.6, Safari 4, Safari 5, Opera, Chrome 4, Chrome 5. 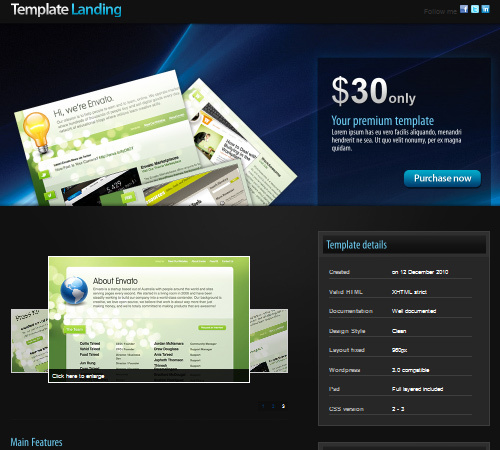 • ThemeForest Files: Layered PNG, Layered PSD, JPG Image, HTML Files, CSS Files, JS Files. 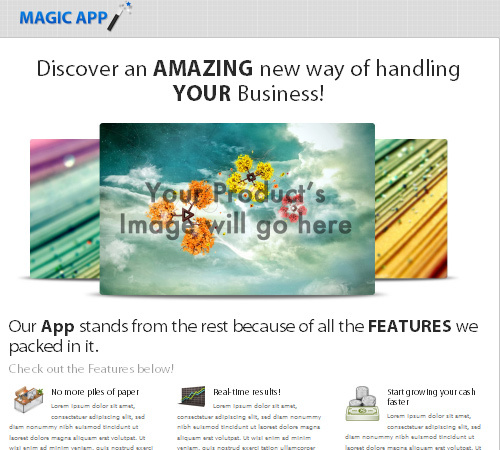 • With Image Slider & Tabbed Area. 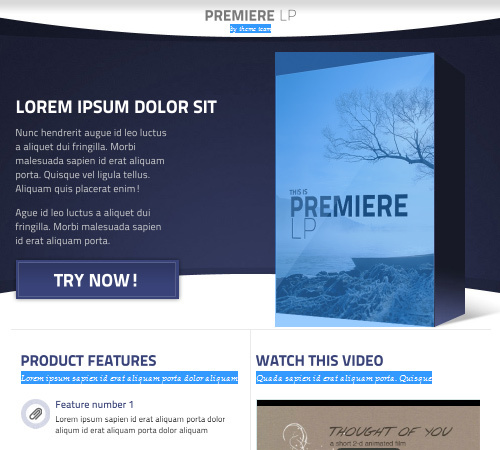 • With Video Preview & Accordion. 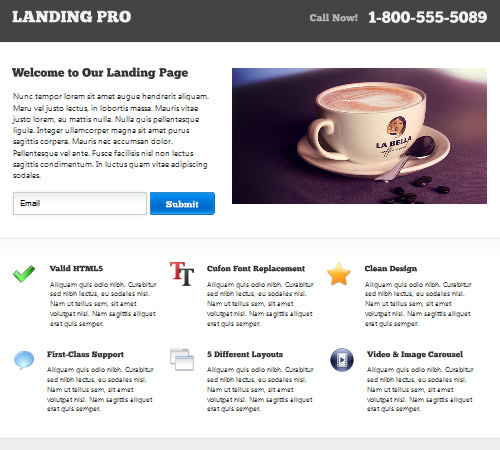 • Valid XHTML and CSS . 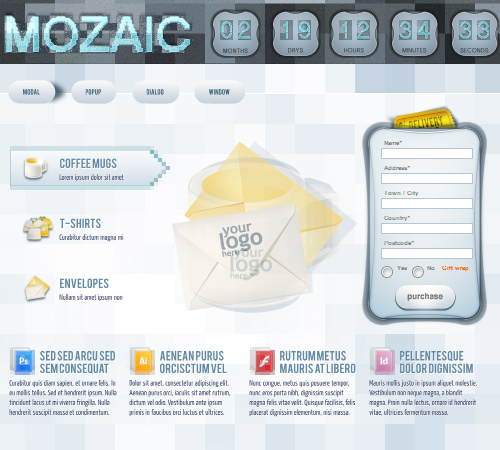 • Cross browser compatible (IE6, IE7 , IE8, Firefox, Safari, Chrome and Opera). • Photoshop files included (including slices). 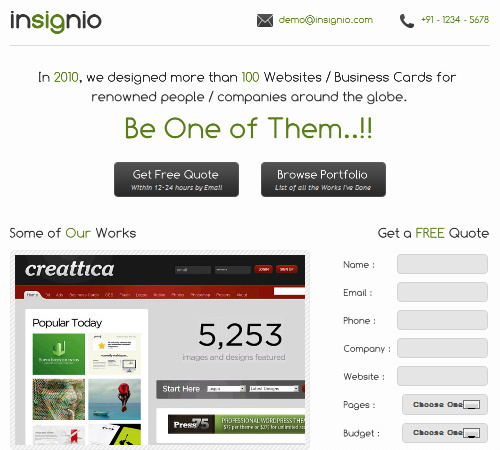 • Built with CTA in mind. • 3 Working AJAX PHP Forms with Validation. • 14 PSD Files (1 Full Sliced Layout & 13 Layered PSD ). 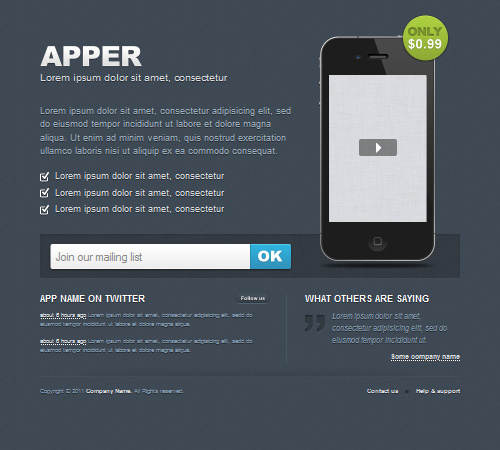 • Jquery cycle Plugin for Image Slider. • 3 colored skin variations (Red and Blue). • Pretty-Photo Light Box Gallery For Product Shots etc. 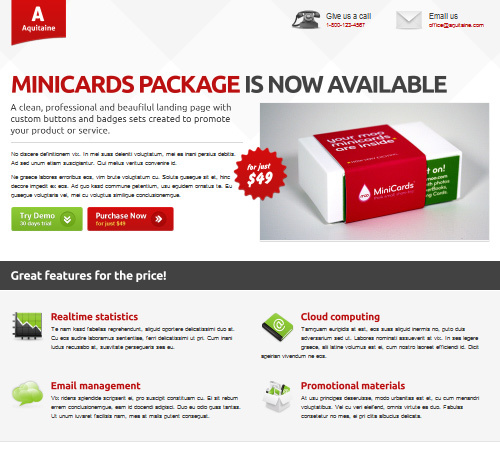 • Clean and professional design. • Testimonials with fade effect. • HTML templates for three variations – basic, variation_1, variation_2. 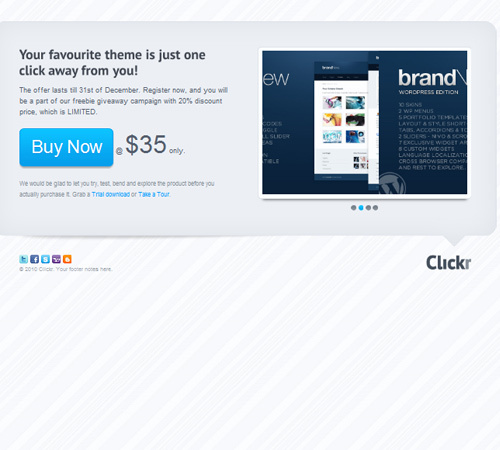 • Thumbnail popup / hover effect. • 3 versions of the template. 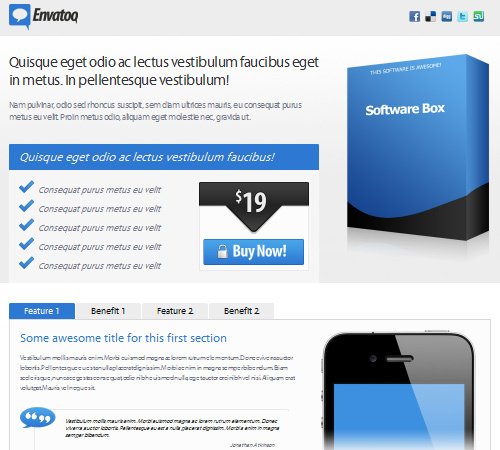 • PSD files for easy customisation. • Social media icons with cool tooltip effect. • Twitter Plugin for Getting Latest Tweets from a Twitter Username. • Carousel image and video gallery. • 5 different layouts included. • Attractive and Modern design. 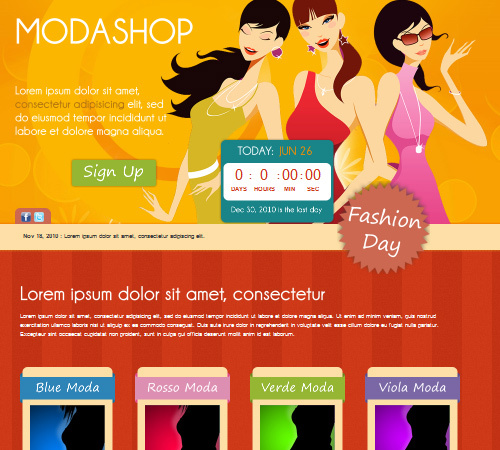 • Valid XHTML Strict and CSS . • Template comes with 3 premium skin options and you can easily modify or make your own skin using by the PSD files. 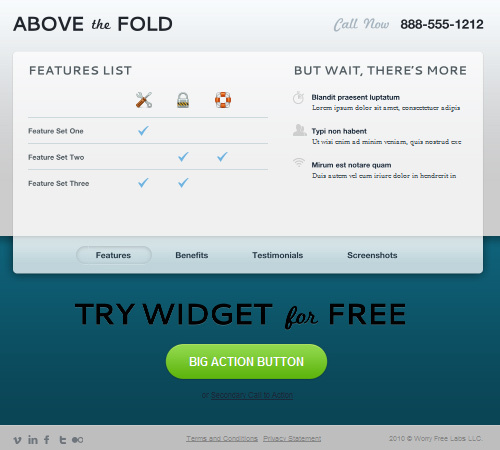 • Download button psd FREE. • Multiple list items style. • 2 colored skin variations (Red and Blue). • Tipsy rollovers on Social Icons. • Custom Feature grid, and feature list. • 20 PSD files included, included individual psd for color options. • Valid W3C HTML5 Markup. • Compatible on major browsers. • Clean code is present. • pure CSS2 (enhanced a little with CSS3). 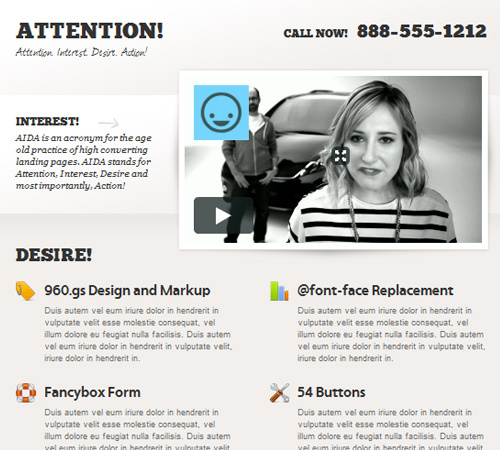 • Contact form with fully working Ajax Contact Form. 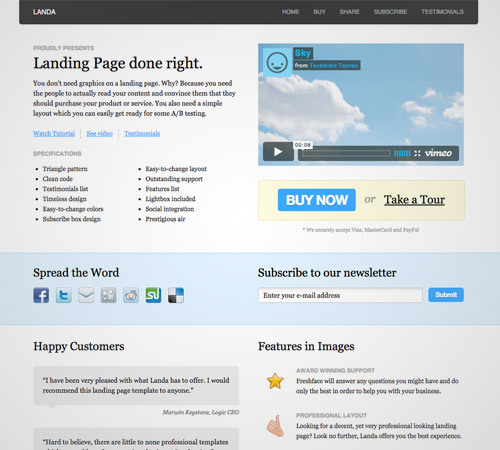 • The Navigation, Header, Featured Area, What’s Next?, Main Content, Newsletter and Footer are all in separate wrapping divs. Appropriately named. 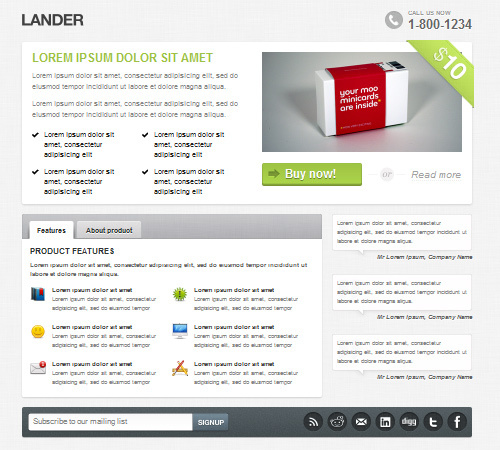 • ThemeForest Files: Layered PSD, HTML Files, CSS Files. • Transparent Gradient Overlay that you can turn on or off for texture (bg color shows through!). 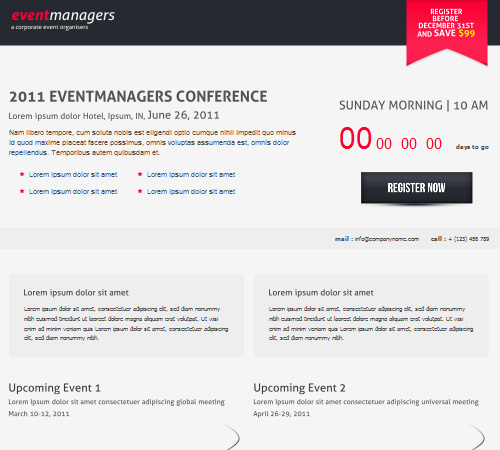 • Modern and professional design. • 54 button color x size combinations. • 3 layered psd files. 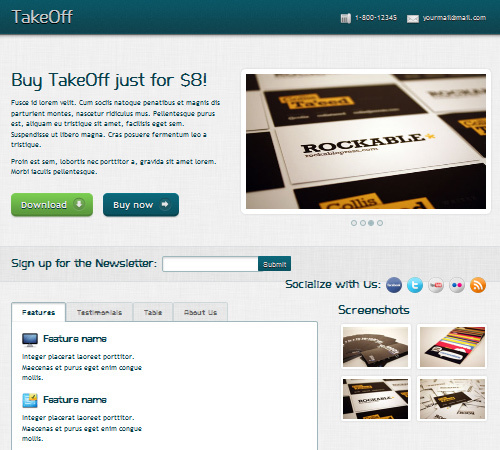 • 2 Different layouts for Buy Now or Download Now. 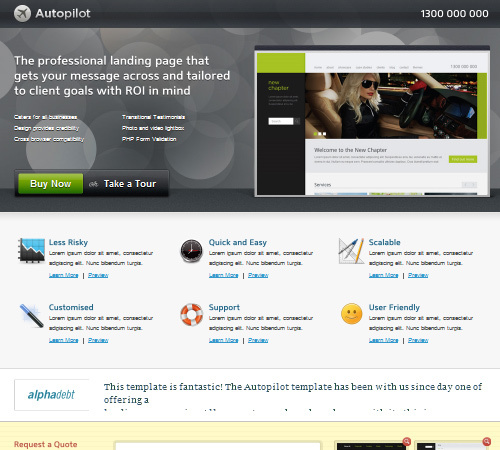 • JQuery Driven testimonial section. • Super Call To Action Areas. This is an excellent and creative collection! Thank you for putting this article together. Thank you for the compilation, Marvi. I shall come back to this post when I need the inspiration! 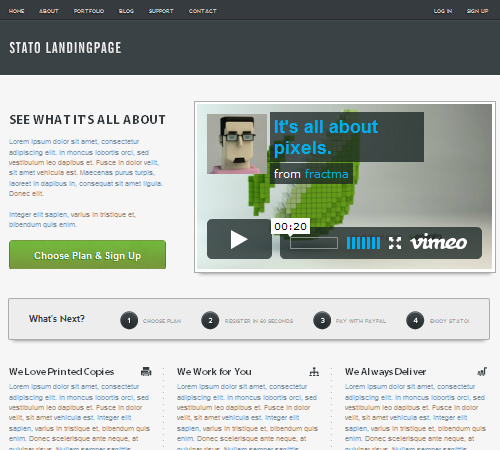 @Patrick I 100% agree with you, its all about conversion not about great looking designs. Wow a huge collection of landing templates. gonna use one of them now.